Former beauty editor Zoë Foster Blake is the epitome of a slashie. She’s a blogger/columnist/humorist/beauty expert/novelist and now the creator of new skincare line, Go-To. 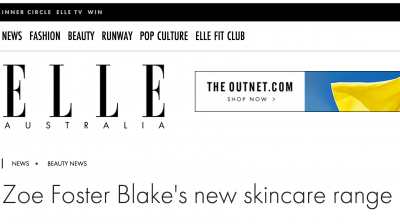 But you probably knew all of that already – Foster Blake’s loyal following (46,000 and counting on Instagram) has propelled her into the Aussie A-list. But Go-To is far from a celebrity-endorsed skincare line, rather it’s the result of nearly two years of work sorting each detail, from ingredients and package design to the clever product descriptions. “I want to surprise and delight anyone who tries it,” she says.